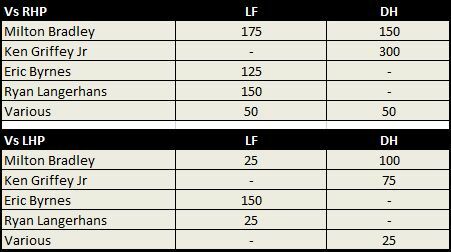 A month ago, I laid out the expected playing time for the LF/DH group on the roster. Since then, the team has made a few roster changes, so it’s worth re-evaluating how we expect the at-bats to be portioned out. Again, quick refresher – there are approximately 1,400 plate appearances to go around, 1,000 of those coming against RHP and 400 against LHP. Because Bradley is expected to play both LF and DH, we won’t see straight platoons, where two guys share one job and two guys share the other. Instead, we’re going to get a lot of mixing and matching, depending on who is pitching, who is healthy, and whether Wak wants offense or defense on that particular day. Here’s my take on the playing time split, as of right now. Against left-handers, it’s pretty easy. Assuming Byrnes is healthy and makes the club in spring training, he’s the starting LF against LHP, with Bradley DH’ing on days that he’s available to do so. Since Wak is not a big fan of pinch-hitting, they’ll accumulate at-bats against RHPs in these starts as well, which is why you see PA totals for batters against same handed pitchers, even if they’re going to be platooned. Against right-handers, it’s a bit more complicated. You’ll see days with Bradley in left and Griffey at DH when both are healthy, probably towards the beginning of the season. As the bumps and bruises pile up, I’d expect to see this less and less. When either Bradley or Griffey need a day off, or Wak wants his best defensive team on the field against an opposing right hander, Langerhans would play left. This leads to the following playing time totals for each player. A few points, based on these projections. 1. I know some of you want Byrnes to take Langerhans’ spot on the roster. It can’t happen. You can’t make this work with Bradley/Byrnes/Griffey trying to hold down these two spots between them. Sorry, but three unreliable, injury prone, middle-aged guys with leg problems are not enough to cover two positions by themselves. On days when Bradley starts at DH, you’d have three outfielders on the team. That doesn’t work. 2. Given the amount of playing time available for an LF vs RHP, you’ll hopefully see why we’re giving this spot to Langerhans and not to Saunders. Bradley and Byrnes are going to eat up at least half of the at-bats against an RHP from the LF spot, not leaving enough for a young kid who should be playing regularly. If either Bradley or Junior land on the DL, then there’s room for him, but when those two are healthy, there’s not enough at-bats to go around, so he’s best served hanging out in Tacoma. 3. I know people are speculating about the team adding another RH 1B/DH type to the roster based on Jeff Kingston’s comments at FanFest yesterday, but I’d be willing to bet that he was referring to the team looking for depth at that position from a non-roster kind of player. The M’s have done a nice job of building depth across the organization at most spots, but after DFA’ing Tommy Everidge to put Byrnes on the 40-man, they don’t really have a Triple-A right-handed 1B/DH type who they could call-up if Bradley landed on the DL. Given the current setup, there aren’t any DH at-bats available for a right-handed hitter, so the prospective player they’d bring in would be limited to platooning with Kotchman at first base, and there’s no indication that they want to platoon Kotchman. 4. I’m sure there will be a flood of people complaining that this group doesn’t look very impressive. You’re used to teams having power hitters at these spots, and you just can’t accept that this is the plan. This group is significantly better than you guys think. In fact, I’d bet that the M’s could expect something like +4 wins from this group, which would equal about league average production. A Langerhans/Byrnes/Bradley job share in left field should be above average defensively and about average offensively, while Junior and Bradley should produce at an above average level while DH’ing. The various roster filler guys who inevitably have to fill-in when the injuries pile up will drag down the performance, but shouldn’t play enough to cause too many problems. All told, the total cost of the guys sharing these two positions is about $7 million (Silva’s contract was a sunk cost, so the true cost of Bradley to the M’s is the $3 million that they’re paying the Cubs), and they’re going to get something around a +4 win return on that investment. That’s a bargain, and one of the main reasons why the team was able to spend money to bring in guys like Figgins and Lee. What they’re not spending on overpriced traditional LF/DH types is being allocated to other parts of the roster, and it’s one of the reasons why the M’s were able to be so active this winter. This LF/DH job share may not be your ideal, but it’s a pretty good use of resources. The M’s have mixed and matched a bunch of players with complementing strengths and weaknesses, given Wakamatsu a lot of flexibility in the line-ups he can put on the field in any given day, and managed to create a situation where they’ll get solid performance for a low cost. It’s a good plan. Thanks for the analysis Dave. This really clarifies the problem of having Griffey on the roster. I think if Byrnes can come back at all, especially when it comes to to hitting RHP he’ll be replacing Griffey in the lineup (Bradley shifts to DH). Langerhans is a defensive replacement/4th outfielder. Another possible scenario is that Saunders has a monster spring and takes Bynes’s spot. Then I guess we would need a right handed back up outfielder. Luke Scott anyone? It was kind of snide humor. I didn’t really seem like you were making a joke, rather making a joke out of Dave’s point. Another possible scenario is that Saunders has a monster spring and takes Bynesâ€™s spot. Then I guess we would need a right handed back up outfielder. Luke Scott anyone? Did you really just write this? Sorry. Luke Scott is a lefty. A righty who can handle 1B and OF would be perfect whoever that is. No, Dave’s “point” was actually a statement of fact. I was making light of the supposed insults. Dave has his own style, and yes, it is sometimes harsh, but it’s not meant to be personal. That’s what I was alluding to. Yes, he is. But, in your scenario, wouldn’t Byrnes just become the backup OF? You really shouldn’t characterize Figgins as injury prone. He’s only had two injuries in his 6 year Major League career, and has average 142 games over that span. As well, he played 158 games last year and from the way he played, he looked pretty damn healthy. Very few players are going to be able to play their entire career without suffering from inuries occasionally. Figgins is as durable as most other players are. Langerhans signed a minor league contract. So doesn’t it make sense to park him in Tacoma if Byrnes comes out of spring training healthy? Then Byrnes will be the LF against RHP, and the 4th outfielder. In that case you have not burned a roster spot on a 5th outfielder. In an emergency you can send Chone out to the OF, and Griffey, though not a reliable guy to trot out there regularly, can play LF or RF in a pinch. That is enough flexibility for game day emergencies. So if Griffey is dinged up, and Bradley is dinged up, and Byrnes is dinged up – what do you have? A hell of a mess. Someone needs to go on the DL and someone needs to be called up. But wasting a roster spot on Langerhans seems to not be a wise use of resources when you are so thin in the infield. I can tell from the little reading I have done on this site that Dave seems to really have a thing for Langerhans, but unless the guy can play some infield spot he needs to be parked in Tacoma should the need arise, and his spot on the 25 man roster needs to be filled with a more versatile player who can go to the outfield if the need arises, but could also cover infield spots if needed. I think one possible guy is Tui – he is a good natural athlete who has not long term position on the team – Figgens will be at 3rd and Ackerly (eventually) at 2nd, so perhaps Tui should be groomed for a utility role. He can play 3rd or 2nd already, has played SS in the minors – give him some time during spring training in the OF and at SS and 1st. Develop Tui in this way, and let Langerhans be your deep OF backup in Tacoma – called up if required. I like this better – develop a young player and add some flexibility to the infield, rather than parking a .220 hitter in a roster spot due to lack of imagination. Your premise is mistaken, Langerhans signed a major league contract. Come on Mike, give him a break. Clearly, I lack imagination – you know, the thing that allows you to think that Langerhans signed a minor league contract, that the team has players named Ackerly and Figgens, and that batting average is a good tool to evaluate offensive performance. And, Iâ€™m sorry, but the idea that you can run a Ichiro-Gutierrez-Bradley-Byrnes outfield and call that good is just beyond stupid. Sounds like you’re calling Zduriencik and Wakamatsu stupid. This just may be what they do. Mike and Dave – There seems to be some confusion in the sources on the web about whether he signed a minor or a major league contract. Sports Illustrated online called it a minor league contract(as does Wikipedia, that rag!!. The SI Online article also stated that the contract calls out a specific salary (90k) if he is in the minor leagues. I know he is on the 40 man roster, but my assumption was that he could be kept in Tacoma in reserve – just like Ackley who also signed a major league contract – perhaps my premise is wrong. Anyone know how this would work with Langerhans? Dave – I am sorry if I seemed to insult you when I spoke of imagination. What I meant was that, though it would be great to have the luxury of a 5th outfielder, with a little bit of imagination about how the team can be put together on the field, a 5th outfielder is really not the biggest need. If you take Tui down the road towards being a utility guy, you likely have most of the advantages of carrying a 5th outfielder anyway. Let’s assume that multiple guys are banged up and you need to put something reasonable on the field for a game or two until you make a roster move. The way I see it, you have 4 potential CFs – Guitie, Ichiro, Figgins (he played 96 games there in 2006), and Byrnes (he’s played 287 games there in his career, including 6 last year). I think you can count on one of these fellas to be available. Then we need 2 corner outfielders to be chosen from a list of Ichiro, Bradley, Byrnes, Figgins, and in a real emergency, Griffey. Considering Ichi is an almost automatic in, you really have to chose one from Griffey, Bradley and Byrnes, with Figgens a deep reserve. Certainly one of these three can take the field, or a roster move should already be in process. What I am proposing is to give Tui some reps on in the outfield, some career advice to consider becoming a utility man (for the time being, at least) and see what happens. I have faith that Tui could be a more than adequate corner outfielder with a bit of time spent there. I would certainly think a Tui who could play LF, RF, 2nd, 3rd, and SS would provide better flexibility and be more valuable than Langerhans, who is only on the team really because you are worried about the durability of Griffey/Bradley/Byrnes. I would think that if it was handled right, you could get about 80% of what you get with Langerhans in the outfield, plus much more versatility in the infield should Tui be developed that way. So should they develop Tui in this way, you would have to choose 2 corner outfielders from Ichiro/Byrnes/Bradley/Tui/Figgins/Griffey. That would seem to be quite an adequate list to work from. And please give me a break on the misspelled names. If my points are not valid, blast away. I am hoping this is not a spelling bee as I will have nothing to contribute. “Figgens” may be less excusable, but Ackerly, in this town, is an easy slip up to make. I believe Dave has the plan down, at least as of this moment, I’m suspecting they’re hoping to squeeze another 50-75 ABs vs RHs out of Bradley. I think it’s reasonable to expect Langerhans to get 75 ABs in CF and 75 in Right (or something like that). But I bet they don’t particularly want Langerhans to get more than 300 ABs. Or does Byrnes do some of the backing up at other OF positions? I do think Tui’s best bet is to go to Takoma and play regularly. If he’s ready, in 2-3 months he’ll force his way into the starting line-up either at 2b or 3b (or even 1b! ), potentially freeing Z to do some very creative maneuvering at the deadline. Jon at ProballNW is reporting that according to “the grapevine” Jermaine Dye is in Seattle, possibly taking a physical. Any truth to this rumor that you know of? And if true, what does that do to the roster at DH, LF, and 1B? Technically its a major league contract, but it can also be a minor league contract if the M’s so choose. For 90k, they can outright him to AAA and he has to accept. Of course, he has to clear waivers, but that hasn’t been a problem thus far in his career. There was a Mr. Baseball from an M’s board who many of us miss. From your writing style I don’t believe it is you, but if it is you will recognize my User Name. If it is you, please stop by and say hello. So what makes his contract different than Ackley’s? Certainly Ackley doesn’t need to clear waivers to be put in the minors. Does anyone know the actual rules about this? A split contract, which provides for a different salary when the player is sent to the minors, is not the same thing as a minor league contract. A minor league contract means the player is not on the 40-man roster. So what makes his contract different than Ackleyâ€™s? Certainly Ackley doesnâ€™t need to clear waivers to be put in the minors. Does anyone know the actual rules about this? … I think our vision is someone who can help Ken Griffey in the DH spot, maybe spell Casey Kotchman at first base at times against left handed pitching; thatâ€™s where we see this player fitting in. That’s my vision too. Notice he didn’t say anything about DHing against left-handers, but he did mention left-handers as it pertained to Kotchman. Also, no mention of Bradley at DH. It could be Ryan Garko. Arron, I read the rumors on Dye as well, but they seem to be speculation more than anything. He turned down a $3.3 million contract from the Cubs and he doesn’t seem to be a player Jack Z would give that kind of money to. Plus, I don’t think Dye would make any sense for this roster as it is constructed. This rumor doesn’t passes the smell test. lus, I donâ€™t think Dye would make any sense for this roster as it is constructed. This rumor doesnâ€™t passes the smell test. Not to mention that he’d cost a draft pick. Jermaine Dye was not offered arbitration, so he would not cost the team a draft pick. Garko is the name that is most obvious, but is there any indication that he’d be willing to take this type of spot? Also, he would take away some of Hannahan’s versatility, so they would probably need a more “pure” back up infielder, like Josh Wilson. An 11 man staff only makes sense if they can sign another starter whow will eat innings, reducing the load on the bullpen. Seattle PI is reporting they signed Garko. Garko for $550,000 with plate appearance incentives up to 1.1 mill (600 PAs). Unlikely he goes much past 550,000 unless Kotchman gets hurt. Nice signing. Still low cost and a big bat against lefties. But who does this knock off the team? A relief pitcher? Langerhans? I think those are the only options. Question is, who is gone to Tacoma? Byrnes, Langerhans, or Saunders? This is terrible…Bradley should be the full-time DH…oh well. At some point this offseason, Garko might be willing to take any spot he can get. The same could be said about Dye. There have been several free agents that have turned down deals only to sign later for less money. After years of quality writing and so rarely being wrong, you’d think people would just give Dave/DMZ the benefit of the doubt on any M’s-related subject there is to be had. Have an opinion of what the M’s should do all you want, but you may want to read back through *all* of the posts here at USSM before attempting to discredit something Dave says. The bench is C, Hannahan, 1B Platoon and DH/LF Platoon. Have an opinion of what the Mâ€™s should do all you want, but you may want to read back through *all* of the posts here at USSM before attempting to discredit something Dave says. Maybe you should have waited with this comment until someone attempted to discredit Dave. If Garko has a Major League contract, who comes off the 40 man roster? Langerhans has to be gone. Hopefully he will stay in Tacoma. Maybe a pitcher if they are wise and go with a five-man bench. Exactly. People were asking for a “Plan B” — well, Plan B is whichever of these guys turns out not to be Plan A. Throw the rats in a cage and shake it, and see which one emerges the winner. Maybe Byrnes shows up looking lost at the plate and unable to run in the field, and they cut him. Maybe they just stash Langerhans in Tacoma as insurance. Maybe all of them look good, and the team comes out of Spring Training confident enough in their starters and bullpen that they decide to go with an 11 man pitching staff at least for the early part of the season. At the end of the day ( 😉 ) the key word with Zduriencik is “options” — whether it’s the positions guys can play, the side of the plate they stand on, or the flexibility they give Wakamatsu filling out the lineup card or in the late innings, Zduriencik does not want a roster that traps the team into having nothing but bad choices. And clearly that applies to figuring out last couple of guys on the 25 man roster in spring training, too. Signing a few players to relatively cheap contracts and seeing how they look in Arizona is insurance against injuries and suckiness and whatever. We really need a post about this Garko signing, does this mean 11 man pitching staff? I don’t see who you send down, Hannahan, Langerhauns, Johnson are all required on the bench. If you send Langerhuans down your fourth outfielder is Griffey. I think you could survive with an 11 man pitching staff, especially with the King and Lee pitching 2/5ths of the games. Maybe Brynes isn’t expected to make the team, but then you’re still left with Griffey as the 4th OF. EDIT: You just put it up, you can just delete this now. People are attempting to discredit or question Dave’s intel on every post I read here. People are attempting to discredit or question Daveâ€™s intel on every post I read here. There’s a HUGE difference between discrediting (Dave) and questioning (an opinion). And Dave’s “intel” is his opinion, albeit a very informed opinion. Ah man, I’m going to skip this conversation. Enjoy doing what you do.